To celebrate the thirtieth anniversary of Star Trek in the year 1996, Mattel released this truly unusual (but interesting...) genre crossover, the Barbie & Ken Star Trek GiftSet. This beautiful, oversized "collector's edition" toy includes our man Ken in gold command uniform, and Barbie in red yeoman's uniform, replete with sixties hoop earrings and an almost Janice Rand-worthy hair-style. This Mattel toy features an interesting word to the wise in the lower corner of the box rear. Not just that "Barbie doll cannot stand alone" (does that mean she needs Ken after all? ), but that "Space instruments are non-working." In other words, the nicely detailed tricorder, phaser and communicator that accompany this set don't actually operate. 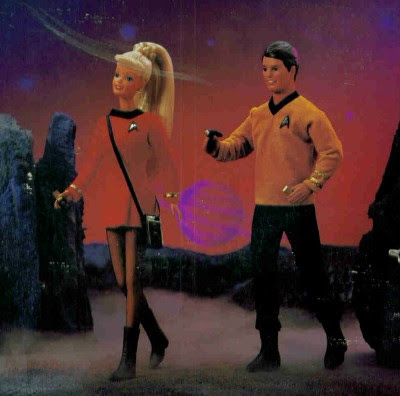 My favorite element of the set is the illustration on the back (featured above; center) that shows Barbie and Ken strolling on what appears to be the planet surface from the episode "Obsession.' Any minute now, a vampiric cloud is going to come over one of those rocky outcroppings and drain the white blood cells from them. Quick...grab the anti-matter! But seriously, it's clear someone took some time with this photo: the low-resting mist, the form of the rocks, the color of the sky...it all clearly evokes the classic series, circa 1968. The Barbie and Ken Star Trek GiftSet box is itself a nice gold color (like the command tunic from the series..), and on the back, Mattel has kindly written in descriptions of the various "space instruments" (the ones that don't work). 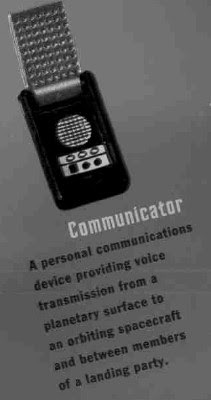 The tricorder is, for instance "a specialized state-of-the-art sensing technology available for specific engineering, scientific and medical applications." The phaser is a "handheld weapon used by Starfleet personnel that can be adjusted to a variety of settings including stun, heat and disruption." 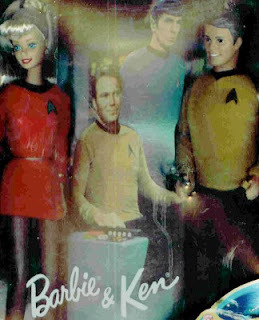 Finally, a nice legend on the bottom of the box celebrates Star Trek's thirtieth birthday, and entreats us to "Join Barbie and Ken" as they "beam aboard" the Enterprise for this anniversary. The legend also notes - correctly - that the Roddenberry series imagines "a constructive future for all mankind." Nice. I was given this particular toy circa 1997 by some dear friends here in Charlotte, and I've kept it on the shelf ever since, though - unfortunately - the box endured some water damage during our move from Charlotte to Mint Hill in 1999 (A Star Trek crystal ball leaked, alas...) Finally, I also remember (but don't have...) another Barbie crossover set. Am I imagining this, or did Mattel also release in the late 1990s a Mulder/Scully Ken/Barbie set celebrating the X-Files? Boy, what I wouldn't do to see a release of a Barbara Bain/Helena Russell and Martin Landau/Koenig Barbie/Ken set! thanks for the great description of this unique set. Hope you dont mind but I borrowed your url to help sell a set for an elderly friend of mine that is needing to downsize. Hope you did a similar one on the Harley Davidson Barbie and Ken dolls, I could use your creative writing skills to help me sell those for my friend too. Seriously though, I think you did a great job of describing my star trek set. Yes John, there was a X-Files Ken & Barbie set, and it's just as amazing as one would think it is. There's also a Herman & Lily Munster set, a Gomez & Morticia Adams set, a James Bond & Bond Girl set, and an Aragorn and Arwen set from Lord Of The Rings. But the one I wanted most is the Superman & Lois Lane set (Superman Returns)!